I admit that I am a sinner and need your forgiveness. I believe that Jesus Christ died in my place to pay the penalty for my sins. 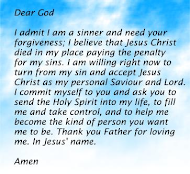 I am now willing to turn away from my sins and accept Jesus Christ as my Savior and Lord. I repent of my sins and commit my life to you. Please send me your Holy Spirit to fill me and guide me from now henceforth. Thank you Father for loving me. In Jesus’ name I pray.